And here is the after shot! 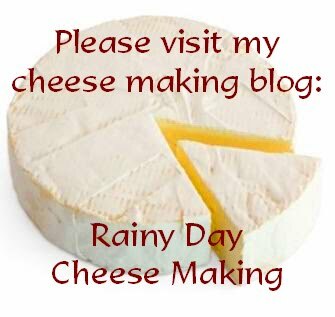 :) Please check out the full post on my other (new) blog Rainy Day Cheese Making! 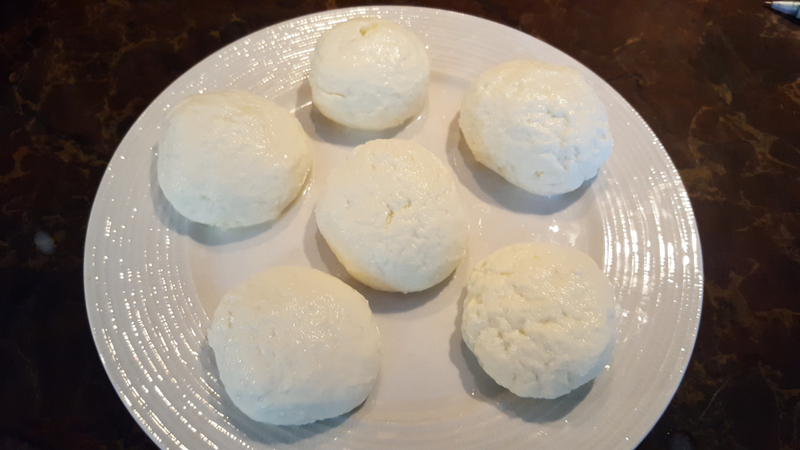 I admit, I had some ifs/ands/ors and buts...but for my first attempt at making cheese, it was a great experience and a well-deserved notch under my cheese making belt! The next cheese will be Cheddar! Summertime is pretty much the only time we eat fruit; well, other than frozen berries all winter in our smoothies. 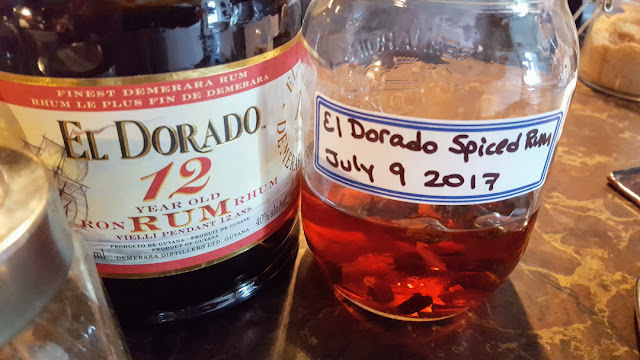 We bought a watermelon the other day and Alex had the idea of adding some spiced rum to it. Most recipes call for an entire bottle of rum for a watermelon, yeesh! I don't want to get drunk off my fruit lol...I just want flavour. 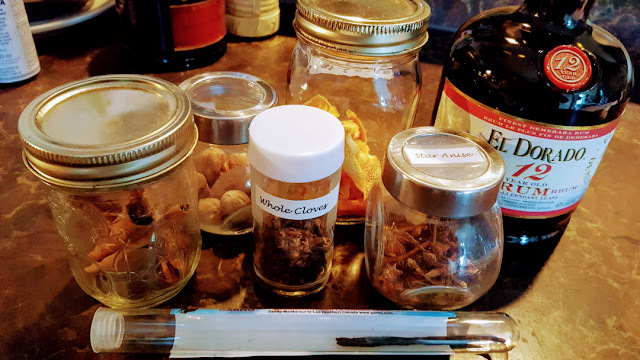 So we kind of put together some "winter" spices (nutmeg, cloves, cinnamon sticks, star anise) and added orange rinds and fresh vanilla bean to the rum. We're going to let that sit for 24 hours, taste it, then add half to the watermelon. I really enjoy Captain Morgan's White Spiced Rum and we're hoping we can recreate that flavour on our own. I'll report the results in a few days! I made this Country Peach Ice Cream a few weeks back, but never had the chance to post about it! It's made very differently from the other ice creams I've made. This one is made with egg yolks. A custard is cooked and then everything is strained and brought together a day later in the ice cream maker. I can't say I'm a big fan of this style of ice cream, called "French Style". Alex loves it though, so I'll keep making this one for him with different flavours. Alex decided on trying out some Cherry Pit liqueurs! 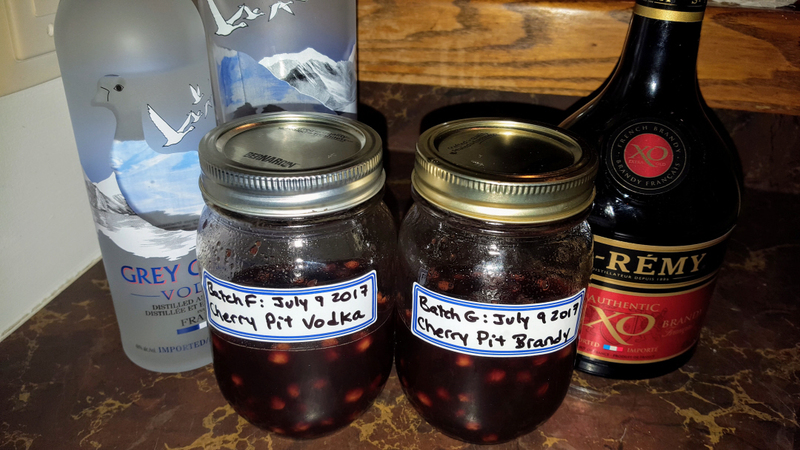 Disclaimer: YES...I know that cherry pits DO contain cyanide...so I'll be feeding Alex a little bit of this liqueur daily for the insurance money....lol...I watch too many old movies. Actually there is so little cyanide in these that you need to actually consume over a thousand cherry pits (chewing them) to suffer any kind of poisoning, so we're good! :) We tasted it last night after simmering it for a while and wow...have you ever had Peter Heering Cherry liqueur? Well, it's close! This will sit undisturbed for a good 3 months as well. Another new creation! I made a "Croque Monsieur" pizza! :) That made two days in a row of pizza, lovely! :) We had leftover "all-dressed" from Saturday night (using the new Mozzarella I made!) and last night I made a cheese sauce (from my Croque Monsieur recipe), loaded it with ham and sprinkled on some Gruyere and ground thyme...I can't describe the deliciousneess of this in words! :) Definitely a keeper! More ice cream making! 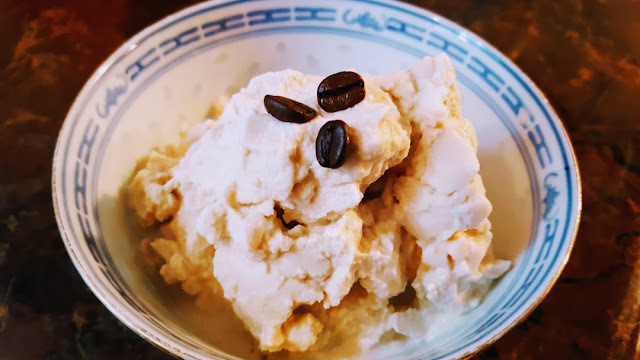 :) I made Coffee Ice Cream this morning. I decided at the last minute to add some Bailey's and it was just wonderful. Ice cream making has become a nice hobby for me! This is the last of the fresh (inexpensive) strawberries! Gosh these fruit "seasons" don't last too long. 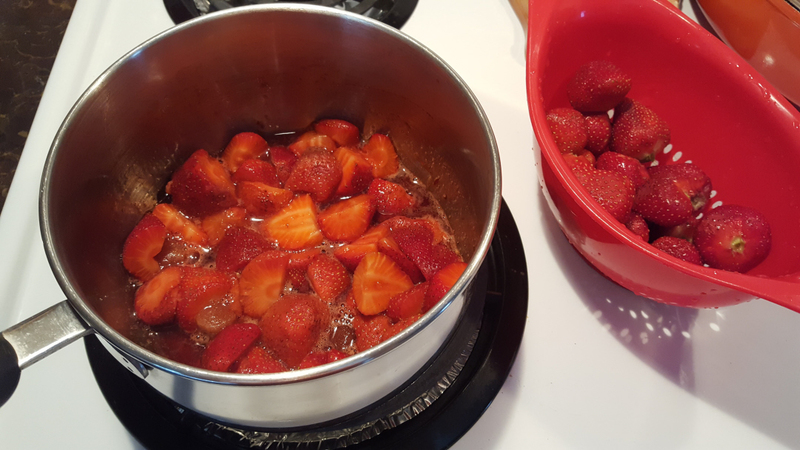 I'm making another strawberry ice cream - but this time I'm making a "coulis" type of syrup and straining it before I freeze it. The last Strawberry Ice Cream was good, but the strawberry bits were too icy to enjoy. I'll report how this turns out in a few days! The rest of the strawberries will likely go to dessert tonight. Pavlov and Marlene. Anyone seeing Pavlov in this photo might think he'd have us for dinner! He was just in the middle of a yawn when I got this photo! So many treats and they all look so good! I have a cherry tree but it has never given me more than a couple of cherries. Not enough to do anything yummy. Hahaha! Had a good laugh with the insurance money! 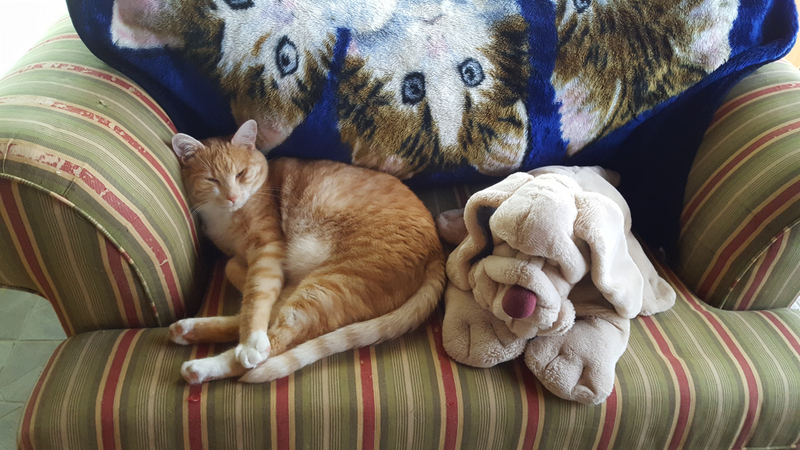 Your pets are adorable. I love ginger cats and hope to adopt one some time in the future. If there's one at a local shelter. Croque Monsieur pizza! What a great idea! right now i am being envious of your energy level as you know very well how to invest it indoor in such amazing creations. you are wonderful and hard working my friend!!! i adore you a lot for your intelligence and activism. i am not fan of cheese though but the final appearance of your cheese made me want to have a bite believe me ,what color and what smoothness. watermelon and rum combination sounds unique to me yet interesting ,hope experiment will be great in result. loved the all delicious food ,specially pizza from left over ,how clever of you sweetie! 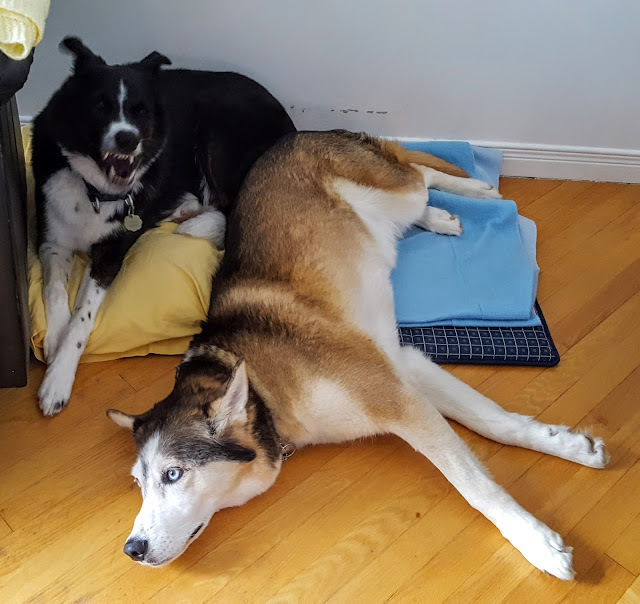 It's testimony to the fact that your dogs (and cats) are happy, content and well-adjusted that your can bring another dog, Pavlov, into their midst and they are fine with it. That wouldn't happen with all households. You and Alex have put so much time and love into your animals and it shows! I love seeing what you make. Everything looks so good. I still have not pulled out my ice cream maker! The coffee ice cream sounds delicious....coffee anything is good in my books! Keep posting these fabulous pictures!!!!! 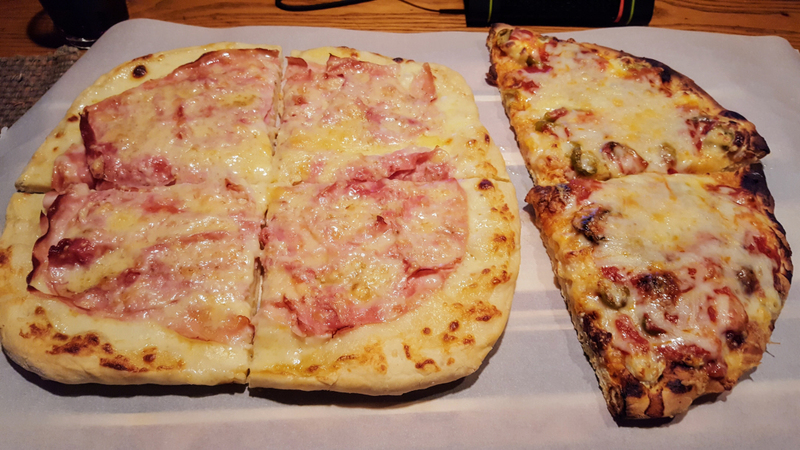 I just had lunch but those pizzas....oh boy! Hmmmm...all this deliciousness. I need to run and make lunch !!! Hi Leigh :) We thought about planting more cherry trees...but then we're renting. At our new place, I'd love to have a big greenhouse for fruit trees. 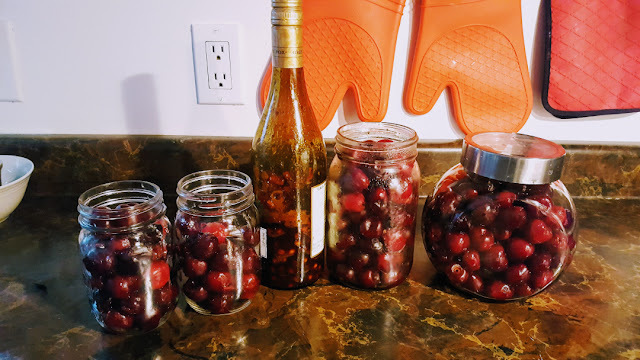 Cherries are so valuable! Hi RO :) Thanks for visiting! Our pets are like our kids, so I guess I'm just one of those proud parents showing off the little ones, lol...glad you got some ideas! Thanks Debra! Next up, poutine pizza? Hmmm....maybe not! Hi Baili :) Thank you :) I don't think I could go a day without cheese! 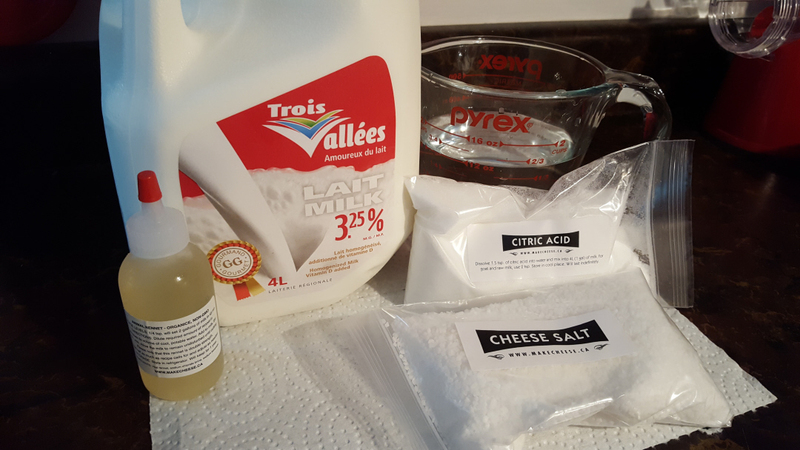 I hope to have a big cheese cave one day so I can make all of our cheeses at home. Sometimes when I look back on my blog posts, I don't know where I found the energy. Days like today, I feel like just doing nothing! Hi Patt :) Thanks for visiting! Pavlov is the sweetest, most gentle dog I've ever met so that photo of his teeth is really funny. The pack gets along really well thankfully! Hi Susan :) Oh cool, I'm so glad you started the cherry bounce! I'm so excited to try it out. We decided on letting it sit for 4 months, so it'll be ready end of October-ish. Lol..I'm glad my foodie pictures stir up so many appetites! :) That's a big compliment. Hi Jenn :) You should get that ice cream maker out!!! 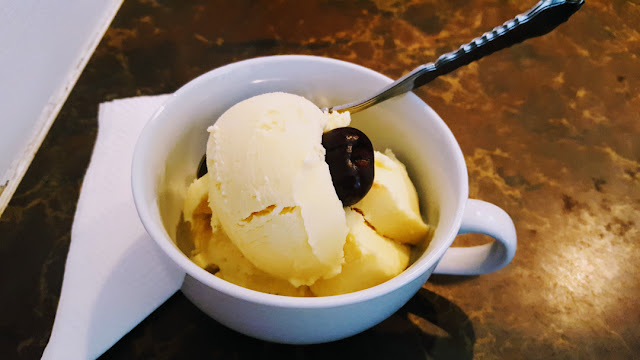 It's so easy to make most ice creams! I made a strawberry one last night, it's so delicious! Next time though, I might use espresso because it was slightly mild for my taste, even though the coffee I used was very strong. Hi Dianna :) Ha ha ha...you DON'T want to move to Quebec, trust me. Most of us (English at least) want to move out...so Manitoba it is ;)! Lol...that cherry/poisoning thing...makes me laugh! We joke about that a lot, he says things like "if you taste almond in your coffee, don't worry about it"...then I tell him I'm leaving everything to the dogs. I really don't know how you're going to get Hunter to sleep! Since we're home all the time, the dogs are just part of our lifestyle. They get lots of exercise and play time. In the winter and on really rainy days, they get bones to chew out their energy. Maybe he needs to expand that energy more? He's just a morning fella...hard when you're not though! Hi Yarrow! :) I will try my BEST not to injure myself while you're away lol...but don't be too shocked if I do ha ha, that seems to be the routine huh? Hugs back!!! When I miss your posts I miss a lot!!!! I'm not supposed to eat milk products (cholesterol) but I love ice cream! I wish I could make my own and eat it but it's probably not a good idea for me. I love your alcohol experiments too but alas I don't do much of that either. The cheese, although a milk product, is something I have a hard time getting away from as so many recipes call for it and a girl's gotta live! Yours turned out fantastic! Look at those sweet balls of moz! I need to drag out that cheese kit I have! 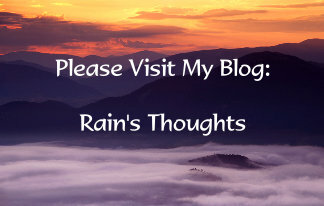 The pizza looks divine and I will be checking out your new blog! You go girl! I'm finally getting back on track after company so hopefully I'll be visiting more regularly....sorry I've been such a lackey! LOL! Yes, Pavlov does look menacing there....glad it was just a yawn!